Hefeweizen. The name conjures memories of eating white sausage, pretzels and a tall glass of Paulaner for breakfast in Bavaria. My mouth is salivating just at the thought of it. The style is as German as lederhosen and Hasslehoff. Doing this style was a welcome change from last month’s debacle which was the pale lager tasting. Although I feel I finally accept them, I still don’t fully understand them. Hefe’s, however, I get. In preparation for this tasting, I did a bit of research. Hefeweizen is a wheat beer (or weissbier), meaning that at least 50% of the malted grains used are wheat. In the German tradition, it uses a top fermenting yeast and can either be filtered or unfiltered. “Hefe” actually means ‘yeast’ in German, so Hefeweizen is essentially ‘yeasty wheat”. Hefeweizen is unfiltered and will have a very cloudy look to it, as Kristallweizen is the filtered, clearer version. Both sit under the Weissbier category. Weissbier is not to be confused with witbier, its Belgian/Dutch cousin. While Witbiers also use wheat in the mash, its name “White beer” comes from the haziness of the suspended yeast when cold. Wit also utilizes spicing from coriander, orange peel, and bitter orange and have a somewhat sour taste due to the presence of lactic acid. 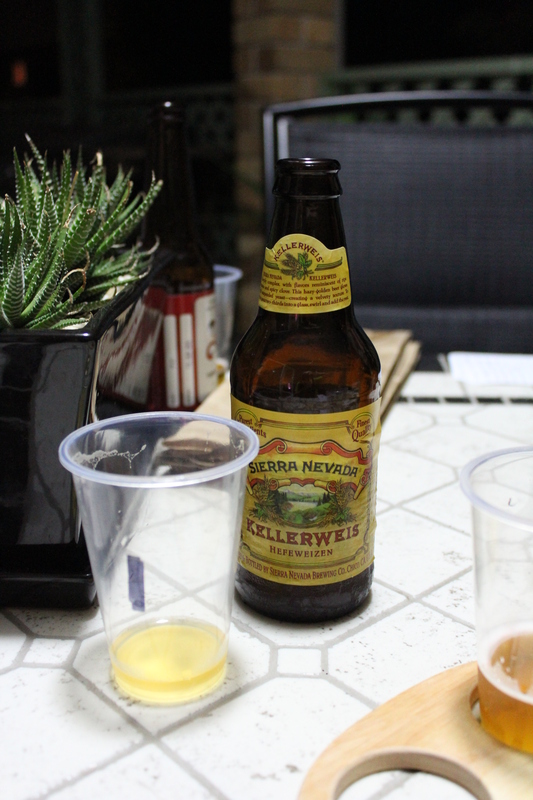 For the sake of this tasting, we stuck for the most part to (and probably completely by accident) Hefeweizen. 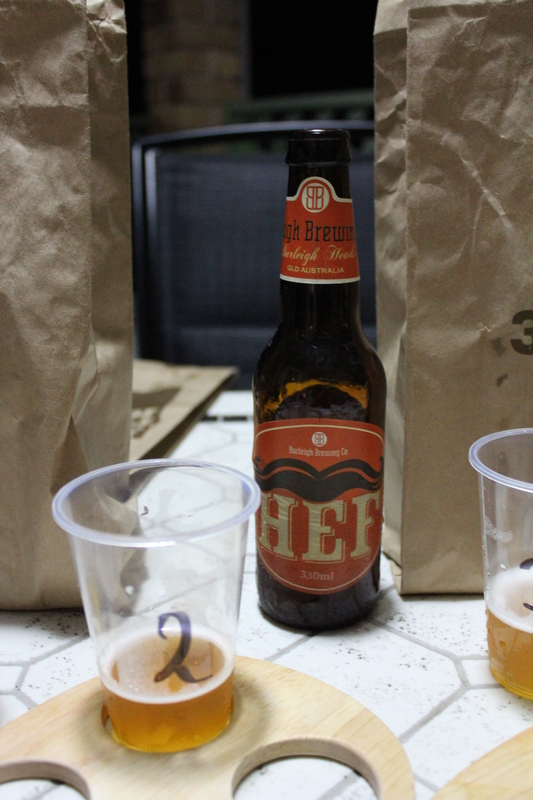 In Australia, Hefe’s are much easier to come across then their wit or Kristal brothers and versions made by Australian brewers can be found, making this the clear and easy choice. If this is the first time you’re reading a “Blind Leading the Blind”, the concept is simple. I buy 5 beers for Nick to taste, and he buys 5 for me. 1 of those 5 is decided upon beforehand as the standard and control beer, with this month’s standard being “Burleigh Hef”. Additionally, 1 of those beers are meant to be from a brewery that is perceived by the community as ‘crafty’ or just out-and-out awful. The remaining 3 are completely up to the purchaser. Handy Beer inCider paddles to help us with our tasting! Being that ‘Hefe’ means ‘yeast’, I’m glad to see there is a good amount of cloudiness in this first one. There is only a small bit of head however, despite a nice stream of bubbles coming up from the bottom of the cup. I’m thinking lack of head is due to an incorrect serving vessel (my fancy term for cup). The aroma from the small amount of froth has a lemon quality. A fair bit of fruity scent is coming from this, along with clove, but it’s not overpowering. My first sip tastes a bit… flat? I didn’t get the hefe-hit I was expecting off the smell. There is a sparkling citrus taste sitting around, but it seems like it’s muted. As it gains a bit in temperature, I’m getting a bit more complexity with clove coming forth, but it’s merely sitting on the back of my tongue, taunting me. A hint of orange is also starting to come through with warmth, but barely. This beer is a bit darker in colour to number 1, and has even less head. Cloudiness is sitting around what I expected, and I reckon I won’t talk about that feature anymore, as they all SHOULD be fairly cloudy anyway. On first smell of Beer 2, there was a high level of grain scent, with a bit of something else. It was something, hiding in the back, but God help me if I can tell you what it actually was! Whenever I thought I could smell it again, it disappeared before I could figure it out. This is probably the worst description I’ve ever given. “Hey, what did it smell like”? “Something. It smelled like something”. Real helpful, Jason. I can at least be a bit more enlightening when it comes to the taste. I got a big hit of vanilla, mixed nicely with a bit of banana. There was a rich, creamy mouthfeel, but the aftertaste left a distinct metal taste that lingered, and heavily offset the positives of this beer. Surprisingly, as the tasting went on, the flavour got worse and the scent got better. Beer 3 is sitting with roughly the same colour as Beer 1, but the head on this one was, as I had written, “Amazeballs”. This had a soft, fluffy head that just wouldn’t go away. My first smell was enough to make me wake up and realize I was at a beer tasting. The first two were a bit of a snooze-fest, but #3 was a different story. There was a great mix of sweet, grain, and spice. I was actually afraid to take my first sip after such an amazing aroma, as I had now set some pretty high expectations. A small bit of foam greeted me as I started on #4. The lacing was not too bad, though. As I took a whiff, I got some unexpected scents. Toffee? Caramel? WTF? I really didn’t know what to think and was left scratching my head. If you took a REALLY big pull through the nose, you could catch a tiny bit of citrus, but that was the only thing that remotely heralded it as a hehe. I know I promised not to talk about the cloudy nature of the beer for the remainder of the tasting, but this one needs mentioning. It’s a bit more clear then the rest, with a darker colour. An almost non-existent head gave off odours of cooked cabbage. My first thought here was “Here we go”. Five hefe’s in and I’m feeling good. Huh. Well, how’d you like that? I will admit, I haven’t had large quantities of Moo Brews version of the Hefe, and maybe this is why. I probably dismissed it as something I don’t like and never purchased it again. I would imagine, however, that my perceived ranking of this if it wasn’t a blind tasting, would be much higher, but the fancy looking bottle could be a contributing factor. The positioning of Burleigh’s Hef actually makes me a bit sad. 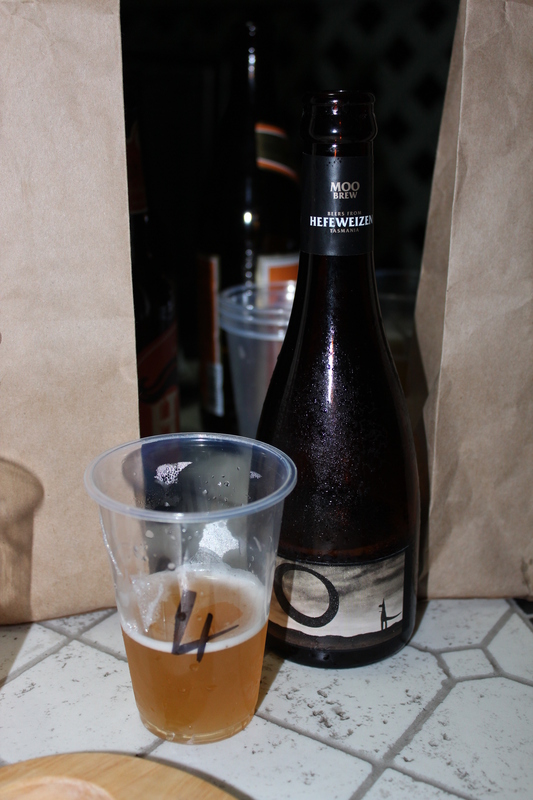 I swear up and down that this is one of the top Australian Hefe’s, but it didn’t prove it this showing. To be fair, this could boil down to an issue of freshness (as most beers do). We did attempt to get some directly from the brewery for the tasting, but there was unfortunately none available at the time. 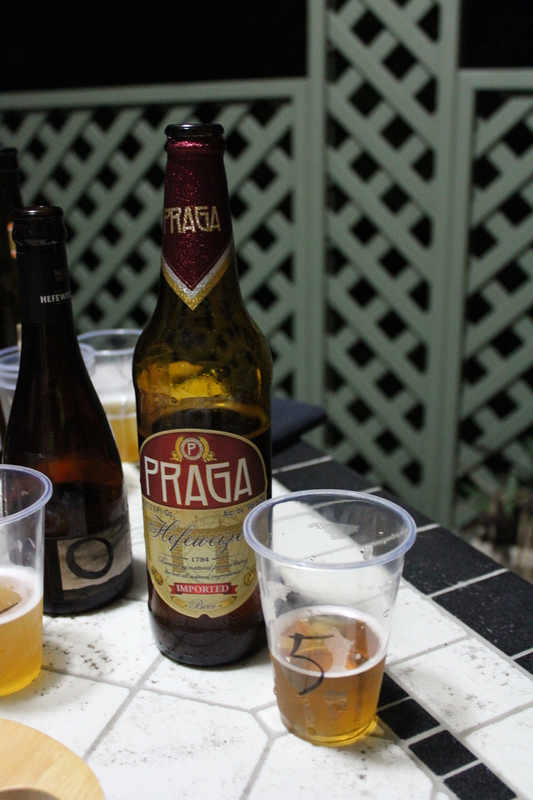 This was my first, and probably my last, Praga Hefe I’ll ever have. It’s a bargain bin beer that didn’t impress me at all. Ah, Sierra Nevada. Pretty much, the king of craft in America. I love their IPA’s, but the Hefe fell a bit short for me. I would definitely get it again in a pinch, but in this tasting, it warrants a mediocre score of 6. 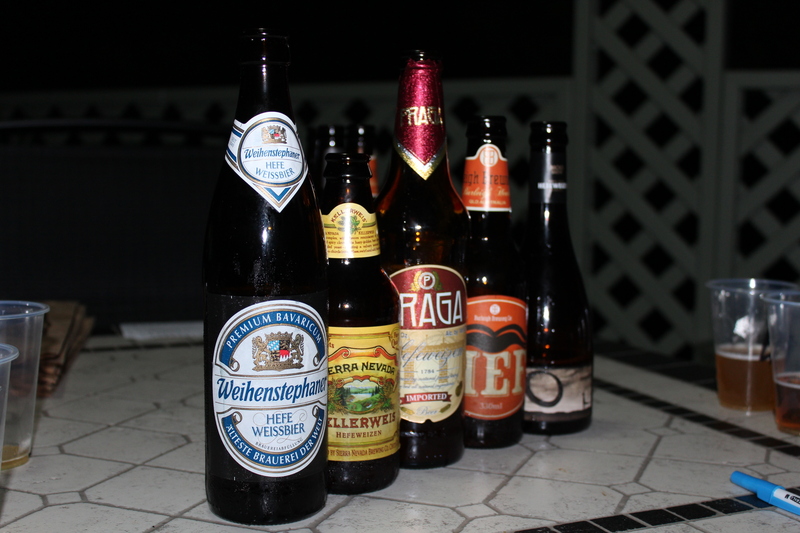 Try as they might, the new world breweries couldn’t topple the old world. And I’m talking REALLY old world; potentially one of the oldest. 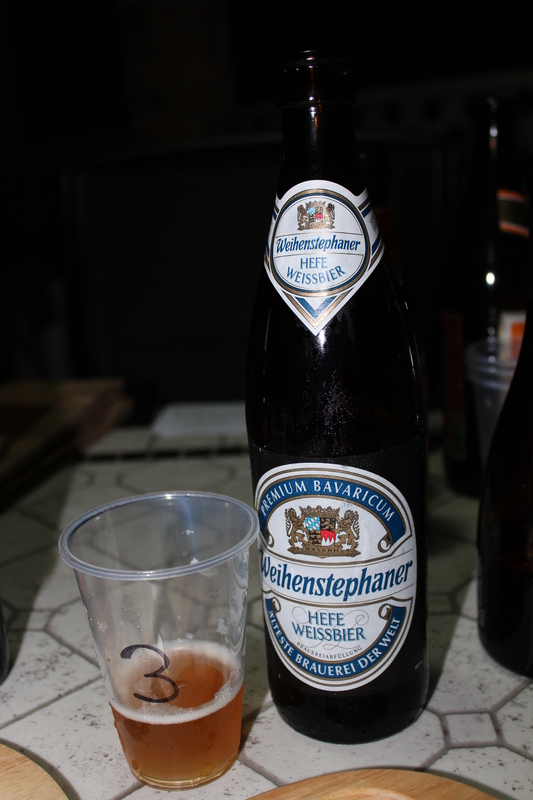 Weihenstephaner lays claim to having a document dating back to 768CE showing a tithe paid from a hop garden to the monastery. This does show pretty good evidence that beer was produced that far back, and if that is the case, then it would officially be the longest running brewery in the world. The official founding date claimed by the brewery, however, is 1040 CE, but with almost a millennium to perfect the recipe, it’s little surprise it tastes so good. Another point worth mentioning is the ratings this beer has received on Beer Advocate and RateBeer. Rating at 98 and 99 respectively, it’s quite clear that this is a standard all hefeweizens should be aspiring to. In hindsight, I probably would have predicted ranking this about middle-of-the-road based on packaging (I’m fickle that way) but after seeing those scores, I would have changed my tune. I must say, anything is better than the lager tasting we had last month. Here’s do hold a certain place in my heart. I’ve been fortunate enough to be able to enjoy this style while in the ‘beer motherland’, Germany, and have been in love with the style since before I knew what good beer was. Based on the ranking, it’s clear I value the traditions the German brewers have been perfecting for well over a millennium. The fact that the world’s oldest brewery took top billing this time around is telling: some things should be just left as is. While the new world brewers can make a decent version of the style, the perfection of it takes years, nay, centuries to achieve. To see the beers I purchased for Nick, and to read his much more entertaining tasting, go to www.chasingale.com. Blind Leadng the Blind will be going into some uncharted territory next month. 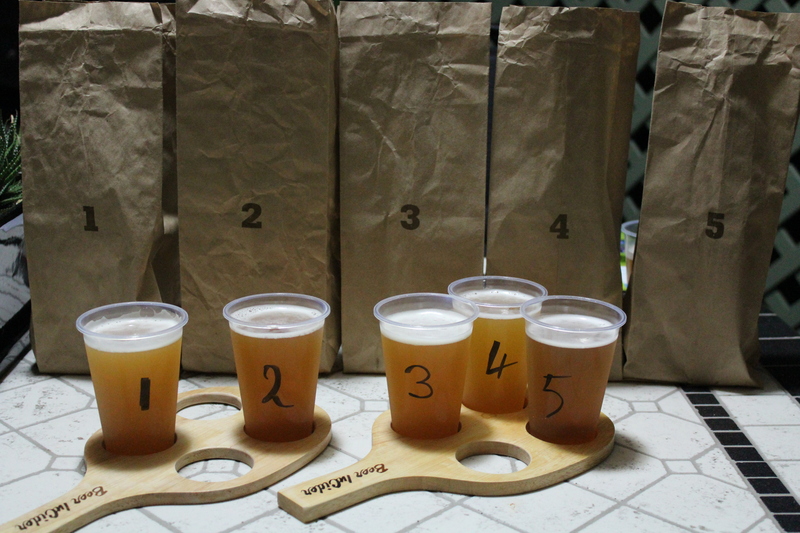 In celebration of Brewsvegas 2015, we’ll be doing something a bit different and blind tasting hops! We’ve attained a bunch of single hop series beers and will be putting our palettes to the test. Will we be able to guess which hops are which? How will each hop stack up to the other? Keep an eye out for the results! Nice work you two, I have to go out now and buy some hefeweizen. Cheers! Let me know what you get!